The next watershed innovation in wireless technology is here: IEEE 802.11 wireless local area networks (LANs). Recent studies from IDC indicate that the Wi-Fi wireless LAN market will likely account for ninety percent of projected LAN equipment revenues by 2005-a trend that promises to spill over into home wireless networks. Yet this amazing growth has also created confusion: Which version of 802.11 is best for vendors and end-users? What about solutions such as the a/g and a/b combinations of the 802.11 standards? 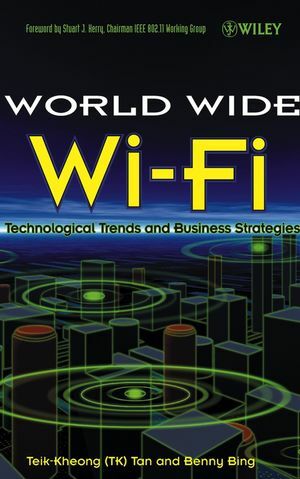 In World Wide Wi-Fi: Technological Trends and Business Strategies, Teik-Kheong (TK) Tan and Benny Bing provide a clear, accessible road map of the Wi-Fi wireless LAN market. Unlike most books on wireless local area networks (WLANs), this must-have resource explains both the business and technology of WLANs, and offers ready-to-use tactics and strategies for thriving in this lucrative field. Along the way, you'll also gain insight into the emerging Wi-Fi standards. Supported by real statistics and case studies, plus profiles of suppliers, regulators, and other market players, this one-of-a-kind guide helps you create effective market penetration strategies and evaluate vendor-specific features. Ultimately, World Wide Wi-Fi defines the 802.11 market: its rapid expansion, its challenges, and its future. Most of all, it's your invitation to profit from everything that this red-hot industry has to offer. Teik-Kheong (TK) Tan is Chair of the Wireless LANs Next Generation Committee of the IEEE 802.11 Standards Working Group. He also chairs the Wireless Interworking Group (a committee supported by IEEE 802.11 WG, ETSI-BRAN and MMAC). He is also the senior product manager for the Wireless LAN Product Line of Philips Semiconductors, San Jose, USA. Benny Bing is a research faculty member with the School of Electrical and Computer Engineering at the Georgia Institute of Technology. He is also the author of Wireless Local Area Networks: The New Wireless Revolution. Chapter 2. IEEE 802.11 Standards. Chapter 3. Wi-Fi Network Security. Chapter 4. QoS Provisioning for 802.11 Wireless Home Networks. Chapter 6. Market Segmentation and Analysis. Chapter 7. Wireless LAN IC Industry. Chapter 8. Emerging Trends and Case Studies for Wi-Fi.